Lars’ guest with one of three nice fish landed that day on a 5-hour trip. 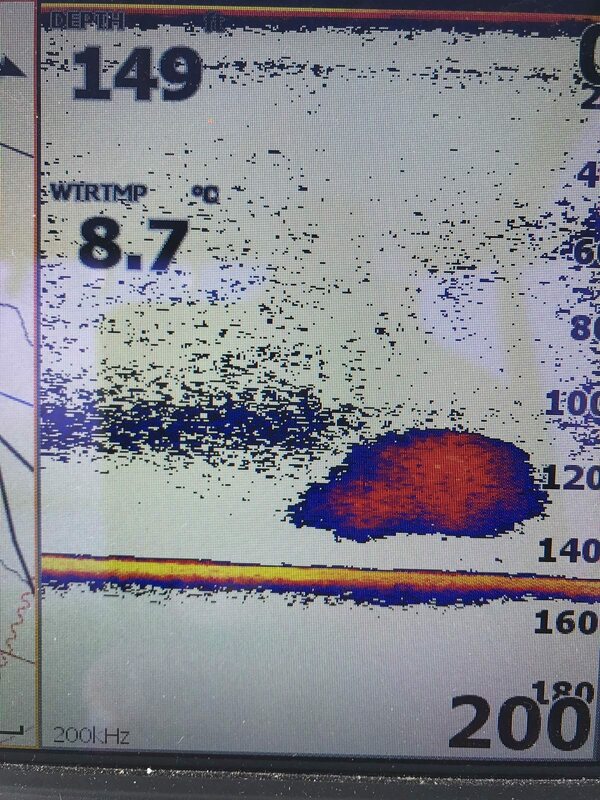 The fish have been anywhere from right off bottom in the shallower waters close to the Bell all the way up to about 60 feet when out in deeper waters off the QA and SE corner of the Hump. This is where good electronics really pay off as we were clearly marking bait balls and arcs on all our trips and adapting each day based on how deep the bait and fish were. Some bait just off the bottom about a third of the way out to the QA from the Bell. We fished some bait this week but spoons were the clear winner and some bigger sizes have been the most productive for us such as 3.5 and 4.0 G-Force and Kingfisher Spoons. The water has some colour to it so spoons with some green and glow on them have been best. Colours like Irish Cream, Outfitter, Homeland, and Kitchen Sink are all good choices. The brighter flashers have been working well too. Green or chartreuse blades with glow tape have been good such as Green Onion Glow, Salty Dawg, or just a green blade or chartreuse blade with glow tape on one side and reflective tape on the other. We did fish Thrasher and Porlier a bit but the fishing has been much better on our side, so we don’t think it is worth running over there quite yet. 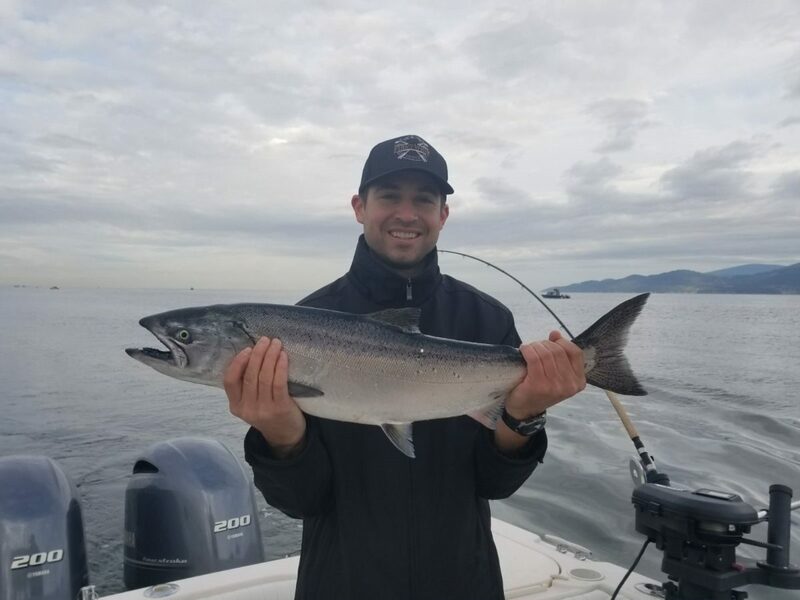 We also haven’t heard any reports off S Bowen yet, so it is still too early to say if that fishery we have enjoyed the last 2 springs will materialize again. 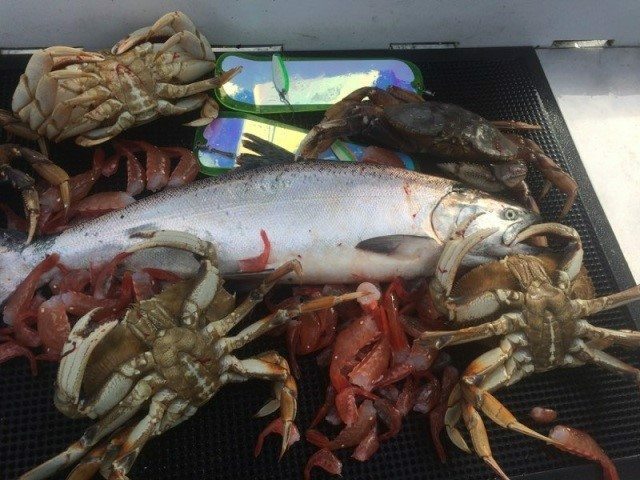 Crabbing has definitely picked up the last few days, it’s not on fire, but it is worth dropping traps. Prawning has been a bit lack luster as most of the spots that are open have been hit pretty hard now. April 1st this will change as more spots are scheduled to open. Chinook, Dungeness, and Spot Prawns from a trip with that Tom guided this past week! On a final note, look out for the seals and sea lions. On Monday I lost 1 fish to a sea lion and the proceeded to lose 3 more to seals. There were over 7 fish lost to seals that day among a small number of boats. If a seal is following you, you might as well pick up and move because if you do hook a decent fish you will immediately “get sealed” so pick up and relocate before this happens. 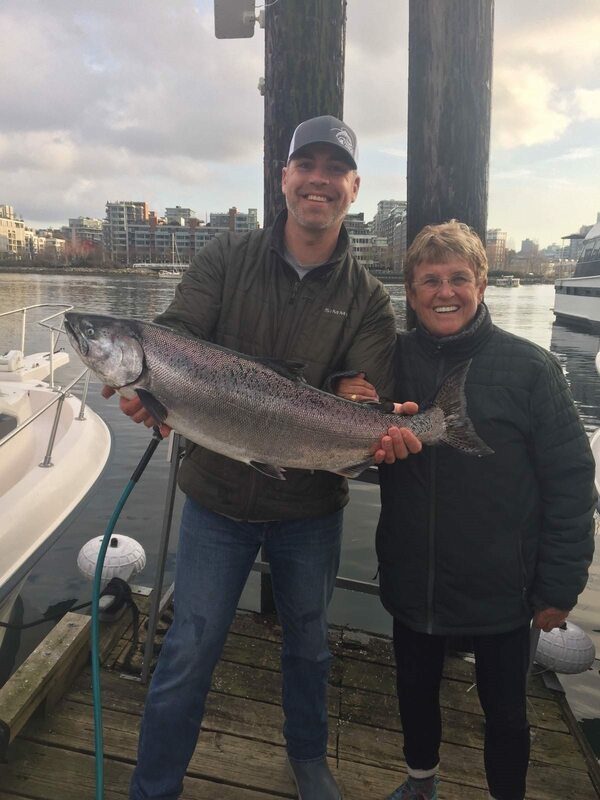 Jason and Jana with a nice chinook, one that the seal didn’t get that day!